The Ras homologous (Rho) protein family is a member of the Ras superfamily of small GTPases. Small GTPases are monomeric proteins and function as molecular switches that turn “on” or turn “off” signal transduction pathways in response to chemical or mechanical stimuli. 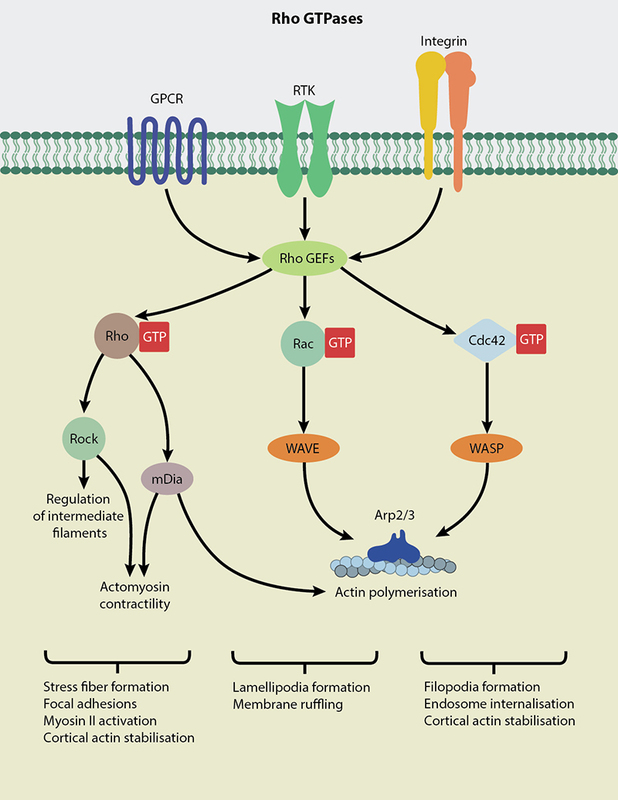 Rho GTPases are central regulators of actin reorganization and consequently function in cellular processes such as cell migration, wound healing, cell adhesion, cell polarity, membrane trafficking and cytokinesis (reviewed in ). Rho GTPases are highly conserved in all eukaryotes studied so far and Rho, Rac and Cdc42 are the most prominent of the 20 members identified. 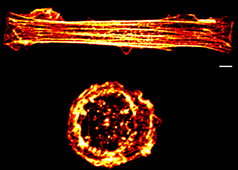 In response to growth factors, Rho promotes the formation of actin stress fibers and focal adhesions , Rac regulates the formation of membrane ruffles and lamellipodia  and Cdc42 is required for the formation of actin microspikes and filopodium . A large number of upstream regulators, categorized as GTP-ase activating proteins (GAPs), Guanine nucleotide exchange factors (GEFs) and Guanine nucleotide dissociation inhibitors (GDIs), regulate Rho GTPases. Being molecular switches, Rho GTPases execute their function by switching from the inactive GDP-bound state to the active GTP-bound state in response to extracellular stimuli. RhoGEFs  promote activation of Rho GTPases whereas RhoGAPs  and RhoGDIs  promote formation of the inactive GDP-bound form. The Rho GTPases are also mechanically regulated. For instance, mechanical activation of Rac1 is required for the force-dependent growth of adherens junctions . Rho GTPases act on over 100 different targets, regulating multiple signal transduction pathways, resulting in diverse cellular functions . Two major effectors of Rho required for assembly of contractile actomyosin rings are mDia and ROCK (Rho-associated kinase) . Rac and Cdc42 activate Arp2/3 complex through WAVE and N-WASP proteins respectively, thereby promoting actin polymerization . 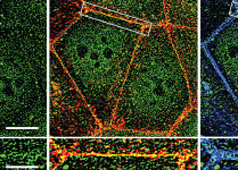 Rho family members are key regulators of actin reorganization and intermediate filaments. The Rho GTPases play a well-documented role in clathrin-independent endocytosis (reviewed in ). RhoA and Rac are involved in a dynamin-dependent pathway, whereas cdc42 is involved in a dynamin-independent pathway known as CLIC/GEEC pathway . Live imaging of Rho GTPases show that during cell migration, both Rho and Rac are active at the leading edge protrusions, contrary to the previous notion of Rac being active at the leading edge and Rho at the retracting edge or rear of the cell . 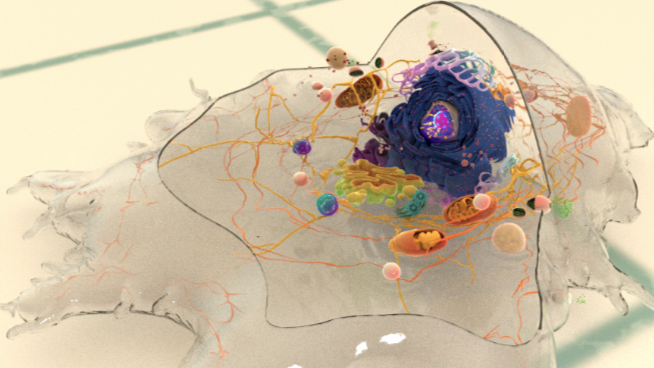 Although Rho, Rac and Cdc42 have distinct functions in cell migration and cellular wound repair, cross-talk between the Rho GTPases and the cytoskeleton is critical for these processes . For example, during wound healing, Rho is required for myosin II activation, Rho and Cdc42 for actomyosin ring stabilization and Rac for actin mobilization towards the wound. Cross-talk between the three GTPases is required for organization and translocation of the actomyosin ring . Cross-talk between the Ras superfamily members are also essential for many cellular functions. In Zebrafish liver cancer models, RhoA was shown to suppress Kras- driven liver tumorigenesis . In ovarian cancer, however, a mechanosensitive Rho-ROCK pathway was shown to increase ovarian cancer metastasis on soft tissues .